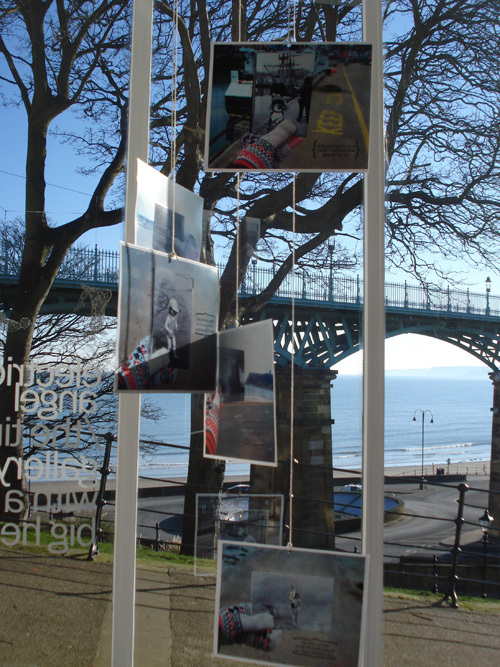 ‘genius loci’ is the title of a brief given to each new cohort on the Yorkshire Coast Schools Creative & Media Diploma. 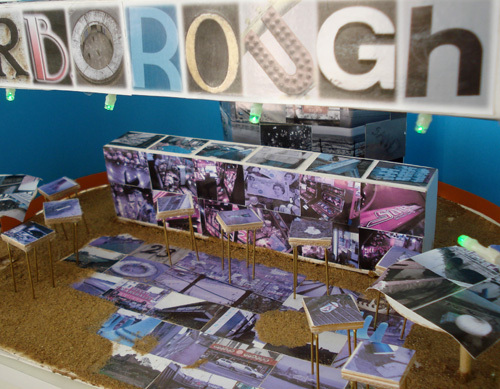 it asks the students (all in their first year of CGSEs) to respond to Scarborough seafront in whatever medium they wish, to capture a sense of place from their unique perspective. 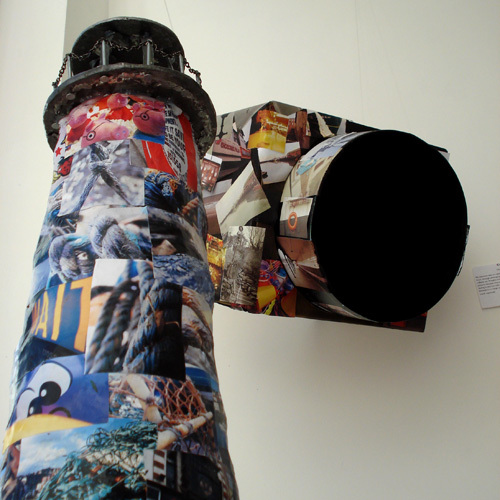 the exhibition features photography, collage, model-making and audio/video works. 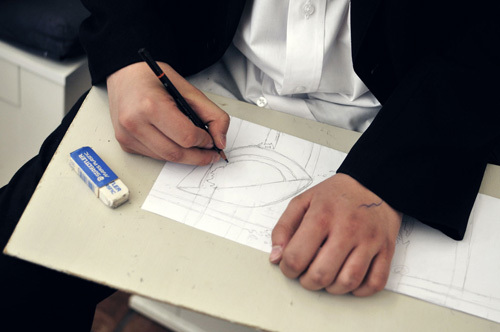 we’re proud of our association with the diploma and continually impressed with the quality of work produced and the attitude and creativity shown by the young people. 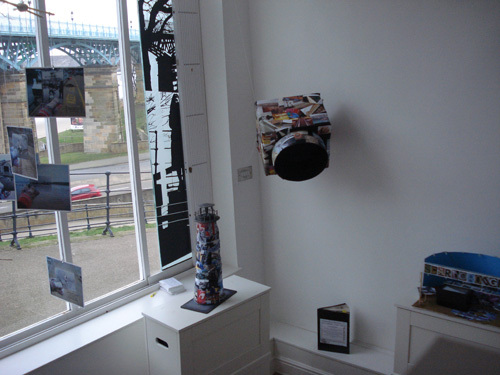 we hope you’re able to pop in and see this selection of ‘genius loci’ responses and be equally impressed. 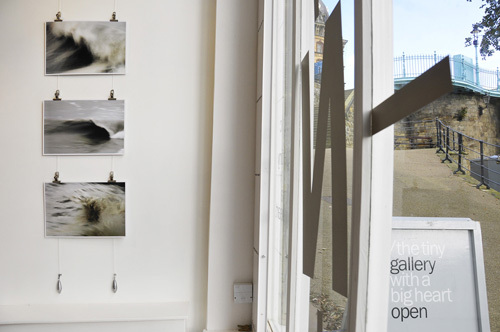 the exhibition runs monday-friday, 10-5 until the 24th february. 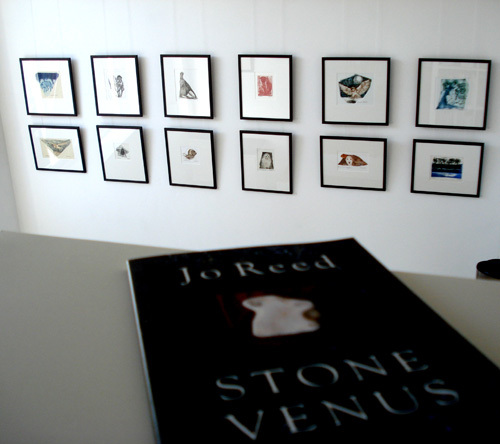 we first met jo when she attended one of the ‘tiny poetry’ nights we held in the gallery. ‘small beginnings’ is a series of prints ultimately destined for future publications, accompanying poems or short stories. 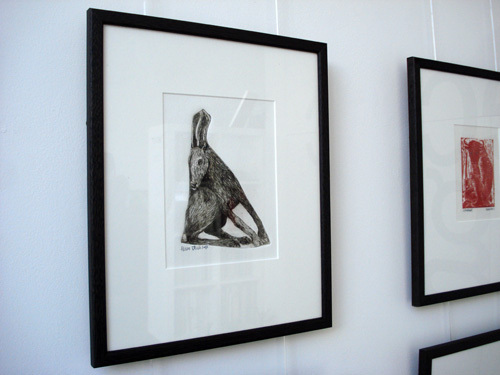 a mix of woodcuts and etchings, each has a tale and jo will be a regular ‘artist-writer in residence’ over the course of the exhibition so people can pop in for a coffee and hear a story or two. 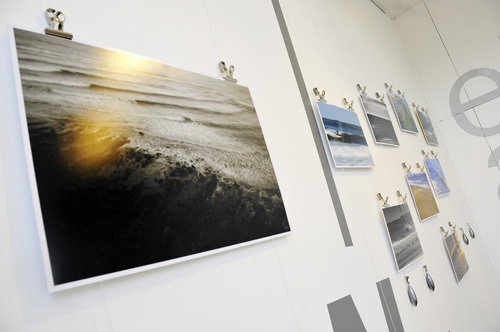 relationship with the environment has been an unintentional recurring theme with our tiny gallery, from rachel’s tree imagery at our launch exhibition through mark dickinson’s poetry and james’s relationship with the sea as someone who grew up here and as an experienced surfer is evident in the images on display. 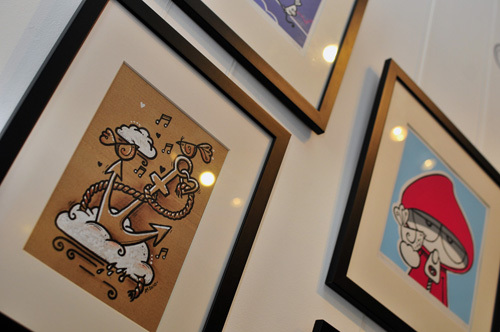 prints are available priced at £15, £20 & £25. 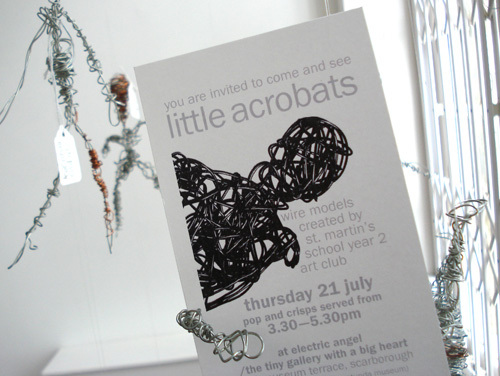 lots of little acrobats take up residence in the gallery today. 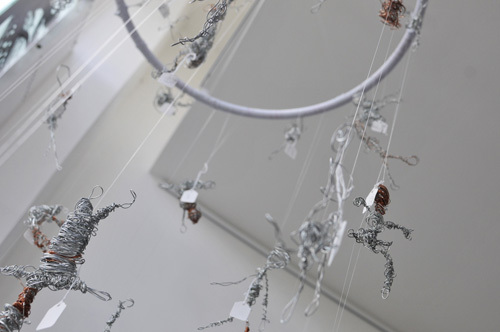 they’re the result of a workshop led by rebecca and local artist rachel welford at st. martins primary school. 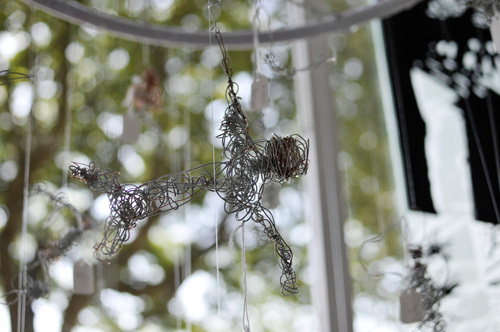 inspired by bob tuffin’s lifesize wire acrobats which we’re currently exhibiting in the trees outside our gallery, these wire characters will be on show over the school holidays. 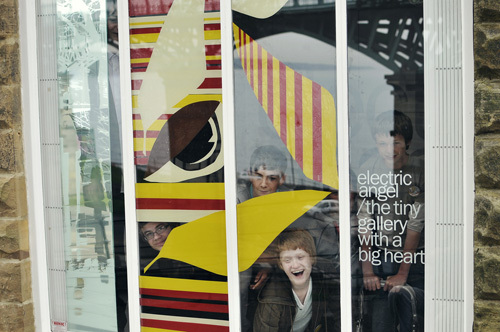 We’re preparing to give over some of our gallery window to an artwork created in 1 day by pupils from Scalby School. 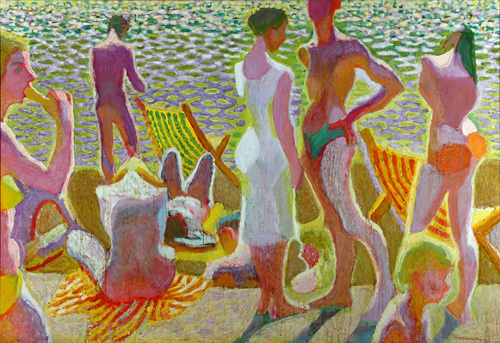 They’ll be joining us on Monday to as part of ‘RSVP’ – a one day project organised by Ian Read at Scarborough Museums Trust in which young people will visit Scarborough Art Gallery to see and learn about a particular painting (in this case, ‘Bathers in Sunlight’ by Zdzislaw Ruszkowski, below) and then work with an artist to create a response. 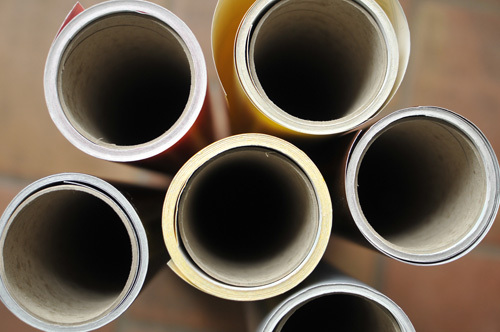 Following on from recent public art projects in which we’ve used vinyl on empty shop windows, we’re going to be using the same materials but this time hands-on with no computer-cutting involved. 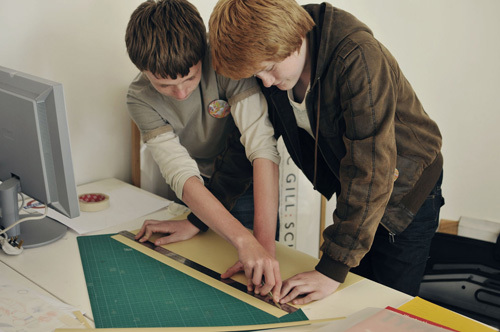 We’ll be drawing, cutting and slicing to go from idea to finished window in a day. 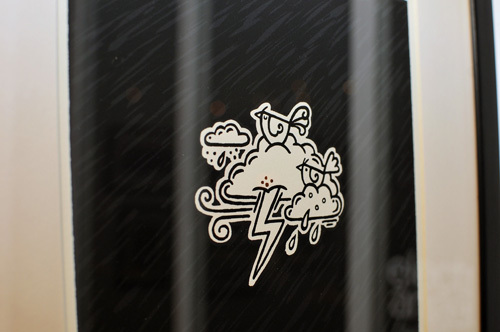 That’s the plan anyway – the window will be available to view for at least a week, possibly longer depending on other plans we have for the space over the coming weeks… The vinyl is standing by, roll on Monday. 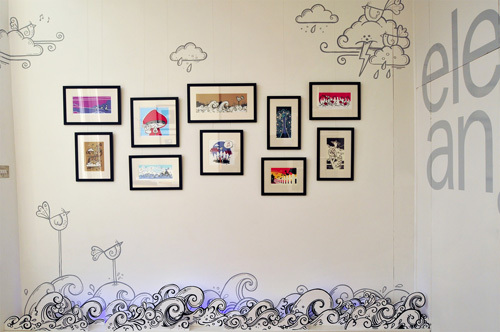 ‘Winter Waves’ is the title of our current exhibition : limited edition screen prints by Custard4gravy. It runs until the 28th January 2011 Summer 2012. 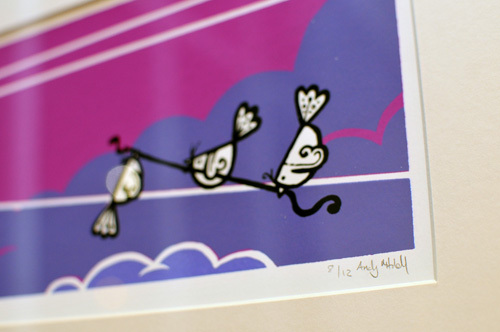 You’ve probably bought Andy Mitchell’s artwork on a greetings card without realising it. Custard4gravy is Andy eschewing the computer and instead handcrafting artwork with strong use of symbolism, bold colours and bolder lines. 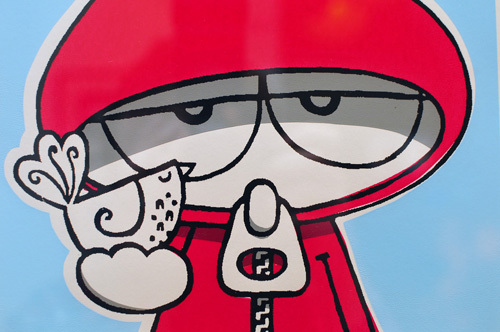 You’ll probably spot influences from graffiti art, comics, Japanese art and popular cultural references as well as Andy’s unique Bradford-born creative voice. Oh, and lots of birds. 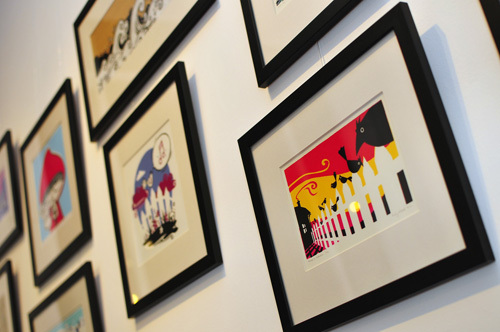 Prints are available to buy online by clicking ‘online shop’ above from just £15. i’ve always loved the texture of screen-prints. there’s something about the density of the ink that makes looking at them a tactile experience. the medium really suits andy’s bold use of line and colour – there’s something very substantial about them. 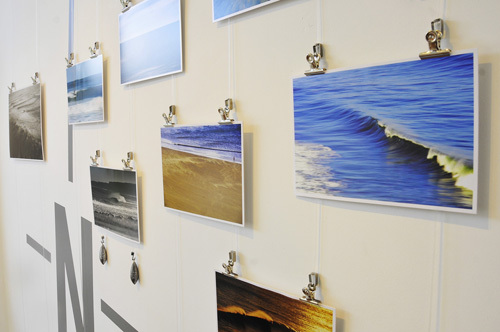 andy’s also been a-doodlin’ on our walls and brought some winter waves of his own to compliment those in the south bay seen from our gallery window. 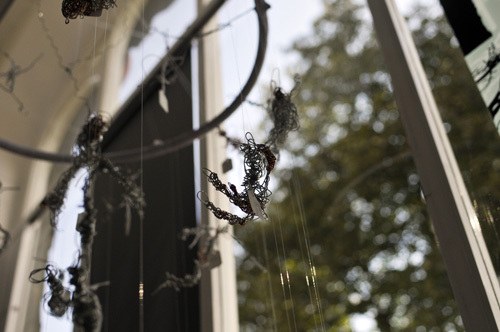 these little birds seem quite happy nesting in our tiny gallery.